…so in search of a better recipe. I always find the base a bit, well, boring. Cooking the apple through with spices gives a nice enough flavour but the texture is just so dull. 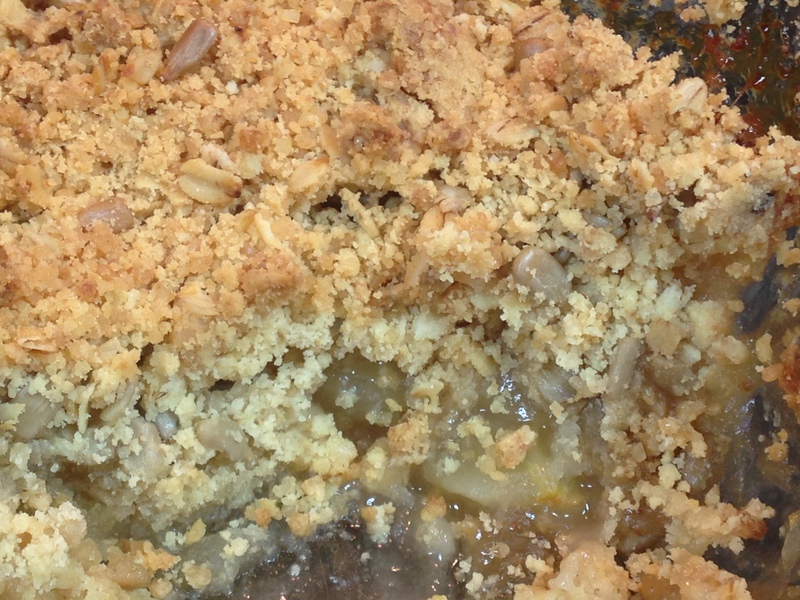 This is the first time I’ve cooked a crumble with raw apples, and took some inspiration from one of Merrilees Parker’s recipes. Tossing them in the flour gives an apple base with lumps of fruit and a sauce that reminds me somewhat of the filling you find in Mr Kipling’s apple pies. Demerara sugar is a must to give the crumble topping that crunch, but I usually add oats and chopped nuts to give a little extra texture. This time I’ve tried a couple of handfuls of sunflower seeds. Amazing! This is honestly just the best apple crumble we’ve ever tasted!